Tango-Etudes pour Flute seule (for Flute Solo) by Astor Piazzolla. 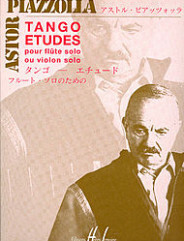 Arranged by Pierre Andre Valade. For flute solo (or violin solo). Latin, Argentina and 20th Century. Difficulty: difficult. Flute solo book. Standard notation. Composed 1987.